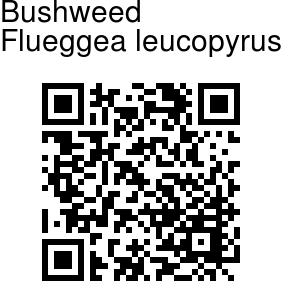 Bushweed is an erect shrub 1.5-4 m tall with branches cylindrical or obtusely angular when young, gray. Final branchlets are spine-tipped, cylindrical and rigid. Leaf stalks are 2-8 mm, grooved. Leaf blade is elliptic, obovate, or round, 1.3-2.5 × 1-1.5 cm, papery to thinly leathery. Leaf margin is not toothed and the tip is rounded. Flower cymes arise in leaf axils or at leafless nodes. 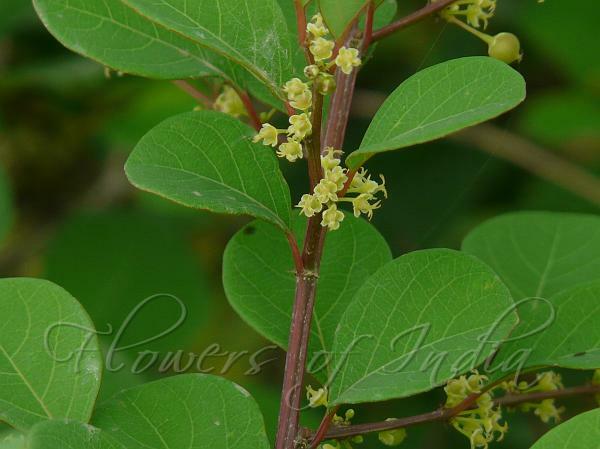 Flowers are tiny, yellowish. Male flowers have 5 petals, 5 stamens. Female flowers have 5 sepals, elliptic or ovate, 0.6-0.8 mm; disk annular. Fruit is a nearly spherical berry, about 4 mm in diameter, whitish when ripe. Flowering: April-July.